Lee Byung Heon’s ‘Gwanghae, a Man who became the King’ has been crowned the most successful Korean movie that was released this year in Japan. 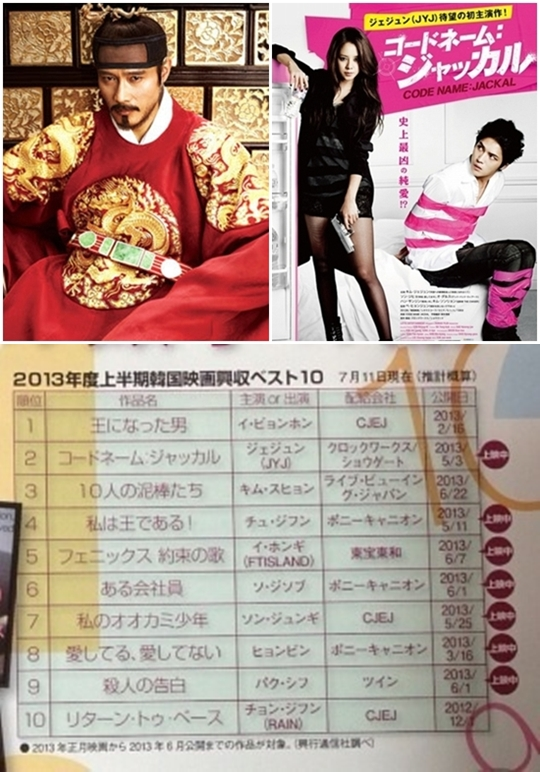 In the edition of Hallyu magazine ‘It’s KOREAL’ that was released on the 26th, a segment that listed the ‘Top 10 Korean movies at the Japanese Box Office For the First Half of 2013’ was included. 1st place went to Lee Byung Heon’s ‘Gwanghae’, which attracted over 12 million movie-goers in Korea. The movie was released in 90 cinemas across Japan in February and was once chosen as ‘The Most Satisfactory Movie’, beating its rivaling Japanese movies. 2nd place went to ‘Jackal is Coming’ (Japanese title: ‘Codename: Jackal’), the debut production of JYJ’s Kim Jaejoong that was released in May. Although ‘Jackal is Coming’ did not do well at the Korean box office, it was sold out on the day of its release in Japan. Its movie making film DVD even topped the Oricon Charts on its release date as well. Other movies on the list included Kim Soo Hyun’s ‘Thieves’, Joo Ji Hoon’s ‘I am the King’, FT Island Lee Hong Ki’s ‘Pheonix – The Song of a Promise’, So Ji Seob’s ‘Businessman’, Song Joong Ki’s ‘Wolf Boy’, Hyun Bin’s ‘I Love You, I Love You Not’, Park Shi Hoo’s ‘I Am the Killer’ and Rain’s ‘R2B: Return To Base’.